Just because they're beans — a statement of fact, even though they are called "peas" — doesn't mean they have to be boring. 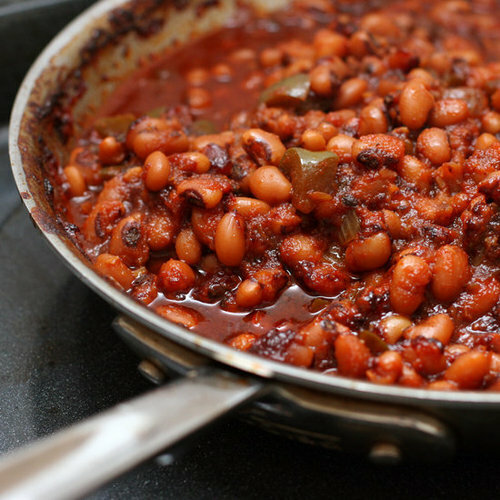 This barbecued baked black-eyed peas recipe is spi-cy (yes, that's two syllables, because this is a Southern recipe and to emphasize that this will open up your sinuses). It tastes smoky and rich, as if it's seasoned with bacon, but the flavors come from the chipotles in adobo sauce. In a large stock pot, combine black-eyed peas with enough water to cover them by two inches. Bring to a boil over medium heat. Skim off any foam, reduce heat to medium-low, and simmer, partially covered, until just tender, about 50 minutes to an hour. Drain beans, reserving cooking water. Meanwhile, in a sauté pan over medium heat, combine oil, onions, and bell pepper. Sauté until the vegetables soften, about five to seven minutes. Add garlic and cook until fragrant, about two minutes. Preheat the oven to 350°F. In a blender, combine the vinegar, lime juice, tamari, tomato sauce, chipotle chile, agave nectar, cumin, thyme, one cup reserved bean water, and three tablespoons olive oil. Puree until smooth, about 30 seconds. In an oven-safe sauté pan, cast-iron skillet, or two-quart baking dish, stir cooked beans, sautéed vegetables, and sauce until well incorporated. Bake uncovered for two hours, stirring occasionally.